With the matchups established, the 2017 OHL Playoffs are upon us, marking a journey through four rounds before one team earns the right to hoist the coveted J. Ross Robertson Cup as OHL Champions. The Ontario Hockey League has produced each of the last two Mastercard Memorial Cup Champions in the 2015 Oshawa Generals and the 2016 London Knights. The Sarnia Sting are well aware of the challenge they face. After losing Jakob Chychrun, Travis Konecny and Pavel Zacha to the NHL, the Sting salvaged what was shaping up to be a promising campaign by clinching a playoff berth in the highly competitive Western Conference. St. Louis Blues prospect Jordan Kyrou steers the ship offensively. Kyrou enjoyed an OHL-high 30-game point streak spanning much of the second half from January 1st to March 12th to lead the Sting in scoring with 94 points (30-64–94). Mid-season acquisition Drake Rymsha has been a shot in the arm for the Sting offence as the Huntington Woods, Mich. native has 33 points (20-13–33) in 28 games in black and gold. Overage veterans Kevin Spinozzi and Jeff King will get a workout on the blue line in this series, drawing big assignments against Erie’s deep core of offensive talent as the Otters can put up a crooked number fast if afforded enough time and space. The Sting can stake claim to being the team that handed the Otters their first regulation loss on home ice this season as Justin Fazio made 45 saves in a 5-3 Sting victory on March 4th. Fresh off a CHL record fourth straight 50-win season, the Otters look to stretch their well-documented dominance into the OHL Playoffs where they still lack one thing: an OHL Championship. The Otters last hoisted the J. Ross Robertson Cup in 2002 and are chasing a championship that seems overdue in light of the high-end talent they’ve iced in recent years featuring names such as McDavid, Brown, Burakovsky, Dermott and Fox among others. OHL scoring champion Alex DeBrincat ended his season tied for an Otters franchise record with points in 27 straight contests. The Chicago Blackhawks prospect recently tied an OHL mark with goals in 19 consecutive games from January 24th to March 12th. Not to be overlooked, Otters captain Dylan Strome led all OHL players with 2.14 points-per-game, recording 75 points including 22 goals and 53 assists after returning from the NHL’s Arizona Coyotes. The third member of the Otters’ big line, Tampa Bay Lightning prospect Taylor Raddysh finished the season with 42 goals, 67 assists and 109 points. His plus-67 plus/minus rating is the OHL’s highest since London’s Danny Syvret was plus-70 in 2004-05. Otters GM Dave Brown and his staff are ‘all-in’ this year as deadline acquisitions in Anthony Cirelli, Warren Foegele, Owen Headrick and Cameron Lizotte look to put the record-setting Otters over the top this spring. The Erie Otters and Sarnia Sting square off for the fourth time in OHL Playoff history, with the Otters having won all three prior encounters with 4-1 first round series victories. 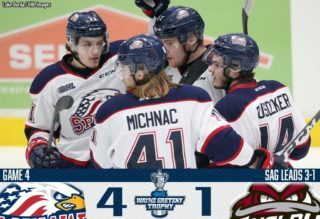 Game 1, Thurs, Mar 23 at Erie – 7:00 p.m.
Game 2, Sat, Mar 25 at Sarnia – 7:05 p.m.
Game 3, Mon, Mar 27 at Sarnia – 7:05 p.m.
Game 4, Wed, Mar 29 at Erie – 7:00 p.m.
Who will advance to the Western Conference Semi-Finals between Erie and Sarnia? The Soo Greyhounds and Flint Firebirds lock up in a matchup that is more than meets the eye. The upstart Firebirds make their OHL Playoff debut and square off with a high-powered Greyhounds squad they gave fits to all season. Last change didn’t mean much between the two teams in their season series as the road team won all six games with the Firebirds and Greyhounds taking three wins each. These two clubs are more alike than they are different. Both have proven top-line scorers, defencemen that can get involved offensively and have similar goaltending situations that have seen both netminders thrust into regular duty at various points in the schedule. Flint’s big line of Ryan Moore, Kole Sherwood and Maurizio Colella has provided a steady source of offence while Dallas Stars prospect and 35-goal man Nicholas Caamano fuelled the Firebirds man advantage with 14 power play markers this season. Defencemen Mathieu Henderson, Jalen Smereck and Alex Peters all found ways to supplement the team’s offence and will have tough assignments to start the series on the road against Sault Ste. Marie’s big shooters. The Greyhounds counter with a deep forward group led by back-to-back 40-goal scorer Zach Senyshyn. He’s joined by captain Blake Speers who has put injuries behind him to record 34 points over 30 games this season. Boris Katchouk, Bobby MacIntyre, Tim Gettinger, Jack Kopacka, Morgan Frost, David Miller and Hayden Verbeek give the Hounds depth to be able to skate with any team in the league. Power play point man Conor Timmins and Minnesota Wild prospect Gustav Bouramman are joined by steady fourth-year vet Colton White on the back end while mid-season acquisition Noah Carroll adds another veteran body to the blue line. The questions for both teams ultimately come in the crease, where Flint’s Garrett Forrest and Connor Hicks have wrestled over the starting job all season. Forrest went 5-2-0-1 with a .908 save percentage in the month of February, but the Firebirds sputtered in March, closing out the season with seven straight losses. The situation is somewhat similar in Sault Ste. 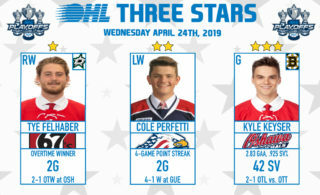 Marie, mainly by way of the fact that 17-year-old Matthew Villalta has battled veteran Joseph Raaymakers to be the club’s go-to guy after going 25-3 this season before being named the OHL’s Goaltender and Rookie of the Month for March. If coach Drew Bannister does opt to go with Villalta out of the gate, veteran counterpart Raaymakers had a pair of positive outings to end the season with back-to-back wins. Both teams can score, but who will come up with the saves? Keep an eye on this West Division first round tilt. The Flint Firebirds are making their OHL Playoff debut and face the Sault Ste. Marie Greyhounds as their first opponent. The Greyhounds and Plymouth/Detroit Whalers faced each other three times. Game 1, Thurs, Mar 23 at Sault Ste. Marie – 7:07 p.m.
Game 2, Sat, Mar 25 at Sault Ste. Marie – 7:07 p.m.
Game 3, Mon, Mar 27 at Flint – 7:00 p.m.
Game 4, Wed, Mar 29 at Flint – 7:00 p.m.
Who will advance to the Western Conference Semi-Finals between Sault Ste. Marie and Flint? The Kitchener Rangers enter their first round playoff series in a conundrum. They, and basically every other team in the OHL for that matter, have had trouble with the Owen Sound Attack this season. Florida Panthers prospect Adam Mascherin and the Blueshirts have their work cut out for them, but a number of veterans wrapping up lengthy OHL tenures will undoubtedly give it all they’ve got in this, their last shot at an OHL title. Overage veterans Darby Llewellyn, Dylan Di Perna and Frank Hora will be leaned upon by head coach Jay McKee as the Rangers try and withstand Owen Sound’s physicality in Games 1 and 2 at the Bayshore. Big centreman Connor Bunnaman, fan favourite Joseph Garreffa and talented rookie Greg Meireles will be looked to for offensive production against a stingy Owen Sound defence that surrendered a league-low 177 goals this season. Playoff experience is always valuable for young players and the Rangers have a storehouse of upcoming performers in their lineup. Rookies Riley Damiani, Dylan Seitz, Cedric Schiemenz, Jonathan Yantsis and first round pick Giovanni Vallati all wrap up solid rookie seasons and will get their first taste of OHL playoff action. 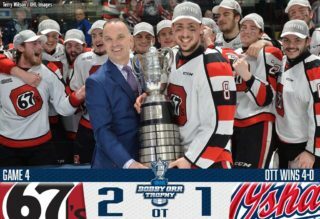 Coming off a franchise-best 49-win season, there isn’t much to dislike about the way the Owen Sound Attack have played this season. They’re quick, they’re physical and they won seven of their eight meetings against Kitchener this season. OHL Player of the Month Petrus Palmu and top 2017 NHL Draft Prospect Nick Suzuki had 98 and 96 point-seasons respectively, the most by an Attack player since the days of Bobby Ryan. Palmu (40), Suzuki (45) and Jonah Gadjovich (46) combined to make the Attack the only team in the OHL this season with three different 40-goal scorers in their lineup. Penalties come at a cost against Owen Sound too. The Attack finished the season with the OHL’s best power play, running at 28.4% efficiency. That man advantage operated at a 50% clip against Kitchener this season as the Attack went 16-for-32 over eight meetings. With Palmu, Suzuki and Gadjovich garnering lots of attention after outstanding seasons, one can easily overlook the contributions of Kevin Hancock, who was recently voted the Western Conference’s Most Underrated Player in the OHL Coaches Poll last week. He, along with point-per-game presence Cordell James and a rock solid defence led by franchise blue line points leader Santino Centorame make the Attack a very dangerous playoff opponent. If the Rangers can hang in there and get some saves from goaltender Luke Opilka in Games 1 and 2 on the road, this one could get interesting. The Owen Sound Attack/Platers and Kitchener Rangers have met in the OHL Playoffs five times, with their most recent meeting in 2012. – 2012 KIT def. OS 4-1 – 1st round / 2006 OS def. KIT 4-1 – 1st round / 2005 KIT def. OS 4-0 – 2nd round / 1998 OS def. KIT 4-2 – 1st round / 1994 OS def. KIT 4-1 – 1st round. Game 1, Fri, Mar 24 at Owen Sound – 7:30 p.m.
Game 2, Sat, Mar 25 at Owen Sound – 7:30 p.m.
Game 3, Mon, Mar 27 at Kitchener – 7:00 p.m.
Game 4, Wed, Mar 29 at Kitchener – 7:00 p.m.
Who will advance to the Western Conference Semi-Finals between Owen Sound and Kitchener? The defending Memorial Cup Champion London Knights and 2017 Mastercard Memorial Cup host Windsor Spitfires revisit their age-old 401 rivalry in a first round matchup that features Friday’s Game 1 live across the country on Sportsnet. Two closely matched teams with no love lost for one another lock horns after splitting their season series with three wins apiece. 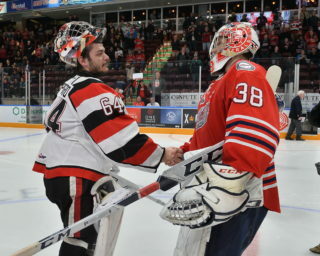 The home team won each of the six matchups between the Knights and Spitfires this season. The Spits enter action playing .500 hockey over the past month. Newly appointed co-captains Jalen Chatfield and Jeremiah Addison lead their club into its most highly anticipated playoff run since back-to-back Memorial Cup titles in 2009 and 2010. Fresh off signing an entry-level NHL contract on Tuesday, Toronto Maple Leafs prospect Jeremy Bracco leads the Windsor attack joined by top 2017 NHL Draft prospect Gabriel Vilardi and 19-year-old centreman Aaron Luchuk who quietly put up 28 goals this season. Big 6-foot-6 pivot Logan Brown has battled through injuries this season but is ready to go for Game 1, providing the Spitfires with a much-needed big body down the middle to counter talented London centremen Mitchell Stephens and Cliff Pu. Windsor boasts the OHL’s top-ranked penalty kill, one that will come in handy against London’s third place power play. Sophomore netminder Michael DiPietro deserves some credit for that impressive ranking after tying a Spitfires single-season franchise record with a 2.35 goals-against average to go with 30 wins this season. Across the ice, Calgary Flames prospect Tyler Parsons posted a 2.37 goals-against average in green and gold while leading the league with a .925 save percentage. He’ll back a Knights offence that, despite losing the big trio of Mitch Marner, Christian Dvorak and Matthew Tkachuk from last season, still has remaining pieces in 35-goal scorer Cliff Pu, veteran captain JJ Piccinich, power winger Max Jones and veteran centreman Owen MacDonald. The Knights feature additions in Tampa Bay Lightning prospect Mitchell Stephens, overage sniper Dante Salituro and Carolina Hurricanes second rounder Janne Kuokkanen while Sam Miletic, who led the Knights with 37 goals this season, will serve a two-game suspension to start the series. London’s blue line, like Windsor’s with Mikhail Sergachev and Sean Day, boasts big offensive upside. Former Mastercard Memorial Cup Champion Mitchell Vande Sompel joins intelligent puck-mover Victor Mete, Vancouver Canucks first round pick Olli Juolevi and sophomore standout Evan Bouchard on the power play while underrated shutdown presence Brandon Crawley gets the tough assignments. The best playoff series are often the ones that could go either way. This clash between the Knights and Spitfires fits that billing. The London Knights and Windsor Spitfires have an extensive history against each other in the OHL Playoffs. This marks the 10th time the two teams have faced each other. 2014 – LDN def. WSR 4-0 – 1st round / 2012 – LDN def. WSR 4-0 – 1st round / 2009 – WSR def. LDN 4-1 – Western Conference Final / 2005 – LDN def. WSR 4-0 – 2nd round / 2004 – LDN def. WSR 4-0 – 1st round / 2003 – LDN def. WSR 4-3 – 1st round / 1991 – WSR def. LDN 4-3 – 1st round / 1985 – LDN def. WSR 8-0 pts. – 1st round / 1979 LDN def. WSR (9-game series, both teams advanced to round robin after protest and both lost to Niagara Falls). Game 3, Tues, Mar 28 at Windsor – 7:05 p.m.
Game 4, Thurs, Mar 30 at Windsor -7:05 p.m.
Who will advance to the Western Conference Semi-Finals between London and Windsor?